There were 552 press releases posted in the last 24 hours and 153,502 in the last 365 days. PALO ALTO, CALIFORNIA, UNITED STATES, July 9, 2018 /EINPresswire.com/ -- CONCEPT Professional Training, a global leader in online professional training in forensic mental health, and Palo Alto University, Northern California's leading school of psychology and counseling, announced today that Dr. Martin Sellbom will present a day-long workshop on using the MMPI-A-RF in juvenile forensic psychological evaluations at this year’s Summer Training Institute at Palo Alto University August 20th – 24th, 2018. 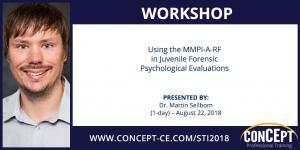 This year, internationally recognized expert in the MMPI-2-RF and the MMPI instruments in forensic evaluations, Dr. Martin Sellbom, will present a workshop on the MMPI-A-RF in Juvenile Forensic Psychological Evaluations. This introductory level workshop introduces the 241-item version of the MMPI-A, the MMPI-A Restructured Form (MMPI-2-RF), to psychologists working in juvenile forensic settings. The rationale for and methods used to develop the MMPI-A-RF, the various materials available to score and interpret the test, psychometric functioning of its scales, and interpretive recommendations will be discussed. A substantial portion of time will be devoted to applications of the MMPI-A-RF in Juvenile Court evaluations. In addition, some topics of particular importance in forensic evaluations from a personality assessment perspective (e.g., malingering) will be discussed in detail. The workshop will also emphasize discussion of how to defend MMPI-A-RF opinions in court for general purposes of use, with an emphasis on Daubert and Frye challenges. Participants will practice interpretation of the MMPI-A-RF using case examples.